The toga was the defining garment of the male Roman citizen, and Romans prided themselves on being the gens togata, “the race that wears the toga”. The most informative ancient source on the shape and arrangement of the toga is a section in Quintilian’s Education of an Orator (Institutio oratoria 11.3.139-48), which we supplement with the evidence of statues, reliefs, and paintings.Toga Much remains uncertain, however, due as much to changing fashions and personal styles over the centuries as to the vagueness of our sources on important matters that in antiquity were taken for granted. The toga used fo r the UCLA performance was modeled on fig. 16, “Large Toga of the Republican Period”, in the standard reference, Louise Wilson’s The Roman Toga (Baltimore, 1924), p. 121. 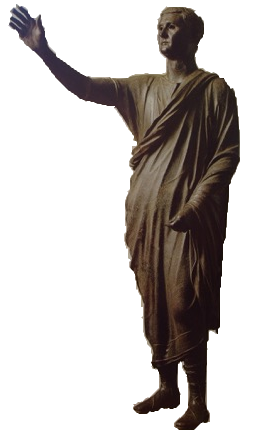 Our toga measures approximately 8 ft. by 16 ft. The tunic worn underneath is rectangular in shape, with neck and arm openings and without added sleeves. It is 3ft. 4in. wide and 3 ft 8 in. long. 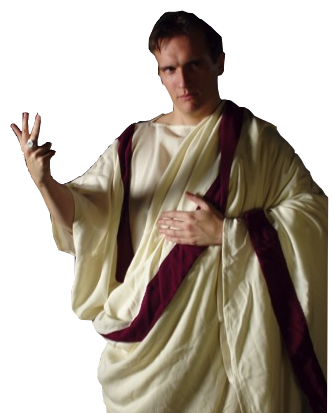 Since the toga has a senatorial stripe, the tunic underneath is not cinched (Quint. Inst. Or. 11.3.138). This toga was planned and constructed by Karen Gunterman, then a doctoral candidate in the Department of Classics. Before returning to the academic world, however, she worked as a pattern maker in the garment industry. Making the toga provided an opportunity to apply this experience to her interests as a classicist. “Even allowing for a sculptor’s stylization of the folds, I believe the surviving statues of togate figures reflect the soft drape of the loosely woven cloth from which togas were made. I therefore looked for a fabric that would drape as do the togas on these sculptures. A. T. Croom. 2000. Roman Clothing and Fashion. Charleston S. C.: Tempus. Pp. 18-29 (Chapter 2 ‘Cloths and colour’). Hans Rupprecht Goette. 1990. Studien zu Römischen Togadarstellungen. Mainz: Zabern. Norma Goldman. 1994. ‘Reconstructing Roman Clothing’ in J. L. Sebesta and L. Bonfante, eds. The World of Roman Costume. Madison, WI: University of Wisconsin. Press. Pp. 213-237. H. Granger-Taylor. 1982. ‘Weaving Clothes to Shape in the Ancient World: The Tunic and Toga of the Arringatore.’ Textile History 13: 3-25. Walter O. Moeller. 1976. The Wool Trade of Ancient Pompeii Leiden.